Such a cool idea from Mary Catherine of Fun-A-Day in our ABCs and 123s series today. 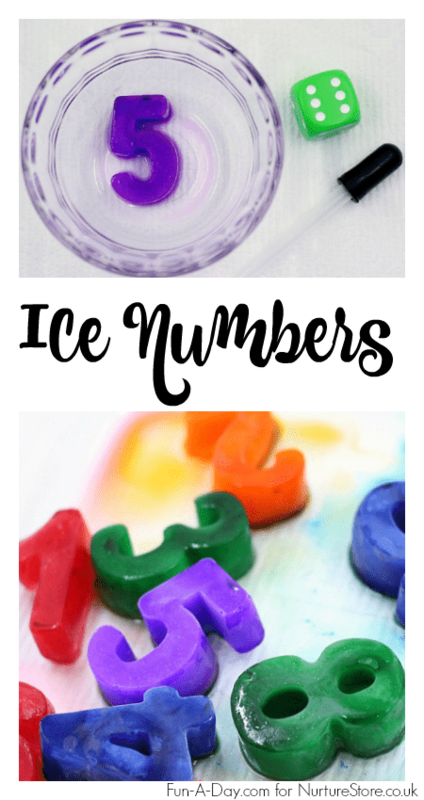 Read on to see how you can make icy numbers and enjoy these sensory math play ideas. 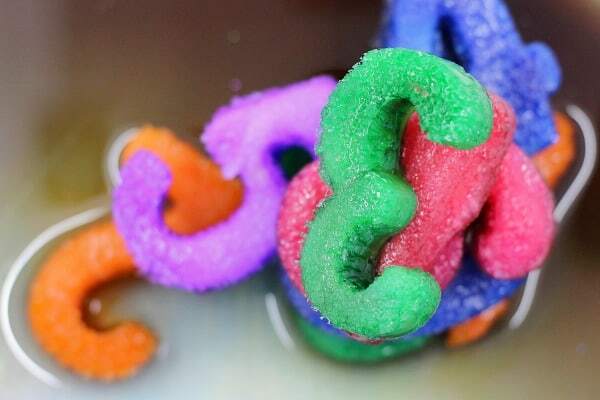 We love hands-on math activities around here, and these colorful icy letters definitely fit the bill. They were inspired by our name ice melting activity, but obviously with a math twist. We have so very many ice cube trays at my house, and very few are used for ice to go into our glasses! One of these lovely trays is full of numbers. We grabbed that one, added water to the numbers, and then put in a tiny dash of liquid watercolors. The tray went into the freezer for a couple of hours before we could get our hands on the icy numbers. Adding magnetic or wooden numbers to regular ice trays would work wonderfully, too! Manipulate the numbers to create new numbers (put 2 and 3 together to make 23, for example). Play a simple dice game with the numbers. 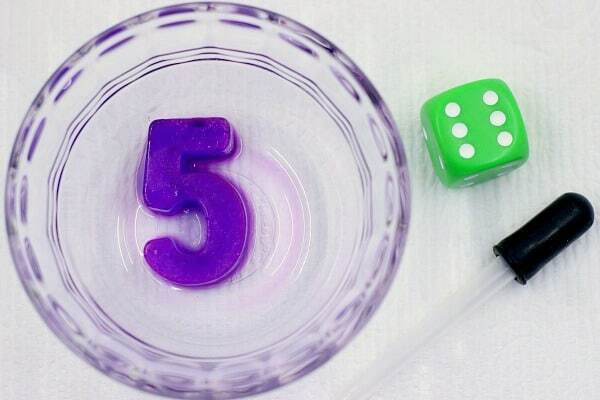 One player rolls the die and uses a dropper to squeeze the appropriate number of water drops onto her number. Then it’s on to the next player. The person who melts her number first is the winner! Add salt to the icy numbers and explore how long it takes them to melt with this addition. 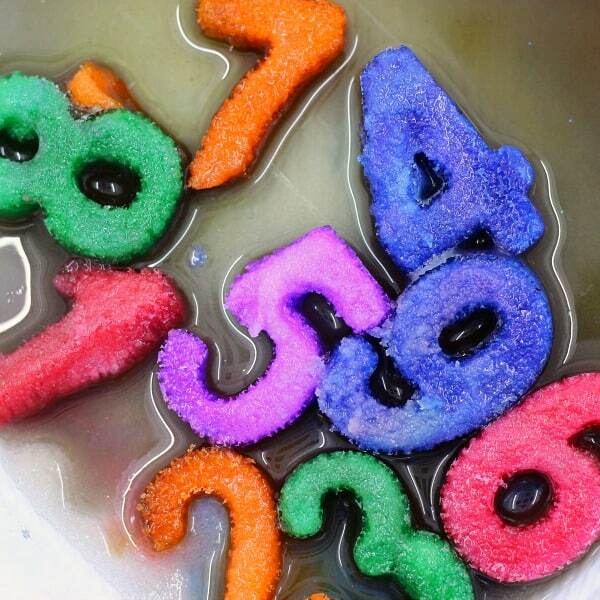 Engage the children in a discussion about other ways to melt the numbers. Observe which numbers melt fastest! Build a tower using the numbers. How high can the tower get? 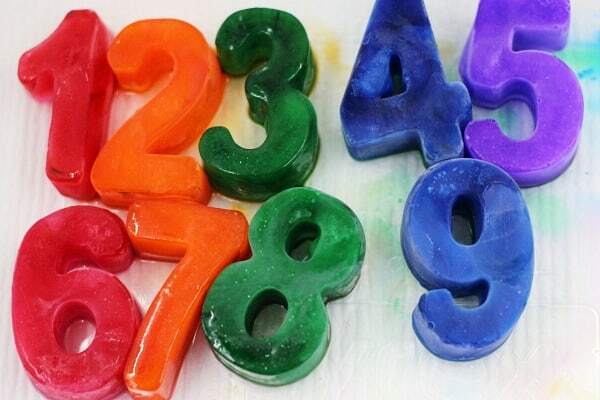 These icy numbers are incredibly simple to make, but so much learning can take place using them! Children can practice counting, number identification, and one-to-one correspondence. Additionally, the kiddos will be exploring with their senses (sight and touch, primarily) and touching on basic science concepts. All with just a few bits of ice! Mary Catherine is mama to 1, pre-k teacher to many, and the force behind Fun-A-Day! Be sure to sign up for her newsletter and grab a free copy of her printable Book of Structures from Around the World.